Native Californians played a variety of stick or dice games similar to this one, which was mostly played by women. Some of these games live on today. 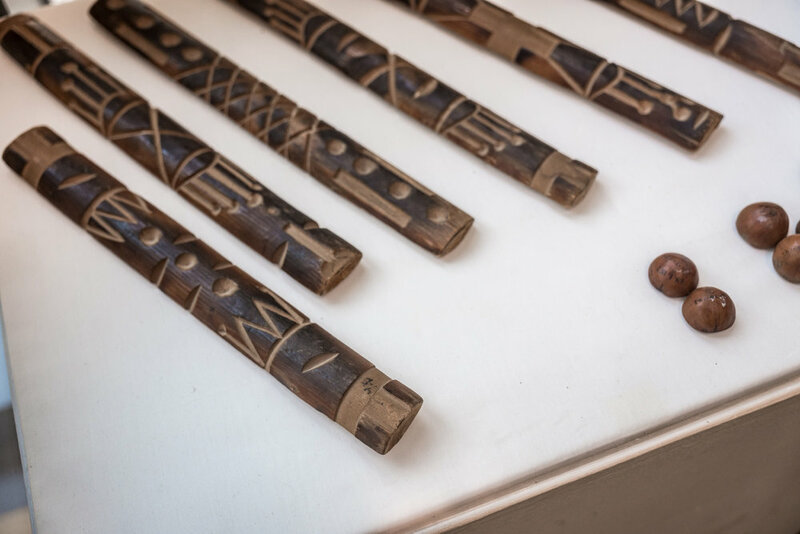 Depending on the local version of the game, the sticks or dice were composed of accessible and naturally occurring materials. For example, the Pomo, Wailaki, and Northern Yokuts used split sticks, whereas the Southern Yokuts, Chumash, and Chemehuevi used filled walnut shells. The number within the set could include four, six, or eight game pieces and the scoring system might depend on whether pieces fell face up (i.e. decorated side up) or face down. In one version played by the Pomo, two points were awarded when all sticks landed face up, one point when three landed up and three landed down, and zero points for any other combination. Come in and see it for yourself, on display in the Museum now through the end of the month. While you’re here, you can help us choose the next Artifact of the Month!